Steve Tucker moved around a lot in 1990, from extended spring training to Greensboro to Fort Lauderdale, The Sarasota Herald-Tribune wrote. Through all the moves, though, his pitching coach at Fort Lauderdale Dave Schuler saw good things in Tucker's approach to the game, according to The Herald-Tribune. "He'll get them swinging at some pitches just outside the strike zone," Schuler told The Herald-Tribune that August. "He's sneaky with the fastball, and he's good at setting up the hitter. He sometimes is disappointed he doesn't have more velocity, but I just remind him he's getting people out." That was Tucker's first season as a pro. No matter what he did that first year, though, Tucker only played in one more season. Tucker's career began in late 1989, signed by the Yankees as an undrafted free agent out of the University of Miami. Tucker was also credited as Tuck Tucker. At Miami, Tucker picked up his sixth win of 1988 with a five-inning effort against Maine that May. 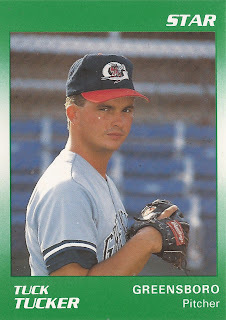 With the Yankees, Tucker got into 32 games between single-A Greensboro and high-A Fort Lauderdale, starting 10. He also had a 4.53 ERA on the year. He also saved three games. At Fort Lauderdale, he got into 21 of those games, ending with a 4.15 ERA and a 6-2 record. His second win came in a June game, a seven-inning complete-game, with six strikeouts. Tucker moved to high-A Prince William for 1991. In 21 games, one start, he had a 7.88 ERA. It was his final year as a pro.